Most fishermen say that the first and most important thing required to make fishing time a delightful and successful experience is to own the best equipments. If you have used fishing reels before and are familiar with the different kinds available then you will most probably agree that the spincast reel is the easiest and most convenient type of reel out there. The simple design and mechanism of the spincast reel makes it ideal for beginners and gives a better understanding of how to handle various fishing reels. They are also the most affordable kind so you actually get to enjoy fishing at very low cost. An amateur or a newbie might find the tangling of the line on other kinds of reels a hassle and time consuming and for this reason the fixed spool on a spincast reel, which is designed to prevent tangles, allows the user to throw precise lines without any issues. Now coming to choosing the best spincast reels in the market; this can be confusing and overwhelming. The market is filled with some great and not so great products, so today we are going to guide you through some best spincast reels models with great value for your money and a buyer’s guide to help you understand your new tool better. 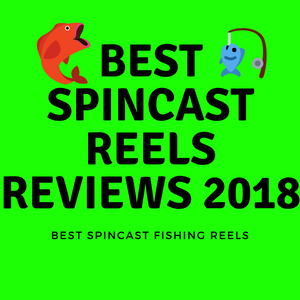 We hope by the end of this article our top 10 list and guide will leave you with better knowledge and the clarity on which spincast reel to choose for yourself. You can now have the best fishing experience of your life every time you decide to go fishing with your friends and family or even alone, for some quiet quality time. Here’s a quick link of the 10 Spincast Reels that we talked about throughout this article. That you click on each of these links which will take you to Amazon. Zebco’s Omega spincast reels are fast pick on our list of the Best Spincast Reels. Zebco’s Omega models are made with the best quality materials and bear some of the most high-end technology in spin cast fishing reels. This particular model is great for kids, newbie and professional anglers alike. With stainless steel bearings, you can be sure of a smooth, noise-free and reliable performance, because let’s face it, the whole point of fishing is to enjoy a calm and peaceful experience. The metal parts are designed to withstand harsh conditions while the reel’s cover is made of aircraft grade quality aluminum. This will ensure that your reel can survive everyday wear and tear and last you for many years. The thumb button on this reel is made of sealed rubber, which is great because plastic ones often cause your thumb to slip when the reel is wet or has become greasy from fishing. The amazing seven ball bearings are made of high quality stainless steel so you can enjoy casting in both freshwater and salt water, provided that you keep your reel clean and in good condition when not in use. For times when your fish decides to go the opposite direction, you can be in control with the continuous anti-reverse action on the handle. The ceramic line and pickup pins help you retrieve more quickly while the level wind oscillating spool and the triple-cam multi-disc drag give you a better balance and command over the reel. If you are interested in small to medium type fishing then the 85 line yard capacity and 2.9:1 gear ratio on this reel will definitely make your casting and fishing time pleasurable. The next is our list is The ZB310BX3 Bullet spincast reel has got its name due to it impeccable speed. Geared at 5.1:1, this reel picks up 29 inch of line with each revolution of the handle, which is as fast as it gets. The Bullet uses patent-pending technology that makes it faster than a 6.2:1 baitcast reel, and faster than a 20-size spinning reel too. With the CNC machine-cut brass drive gear and the 9-bearing (8+clutch) system, you can also look forward to a smooth and reliable casting. 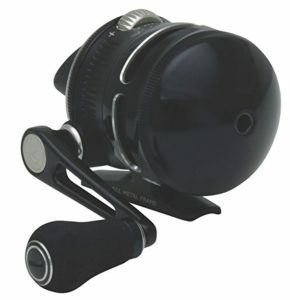 This reel can be used for both left or right hands retrieve with its changeable handle. The revolutionary ZeroFriction dual-bearing supported pick-up pin design and the FreeFlow Micro 3mm line guide increases your ability to cast long distances and have complete power. Pre-spooled with premium 10-lb. mono and comes with a spare spool of line that is very easy to change. Both the GripEm™ handle knobs utilized with 3M soft-touch technology and the forged aluminum and double anodized front cover make this a strong durable reel that can tackle and last you through any weather conditions. You can now enjoy fast and easy casting in any weather. The only little drawback that a few users have mentioned is that the tool is a little heavy when compared to other spincast reels and may cause fatigue after longs hours of use. The Pflueger President Spincast Reel is 3th on our list of the Best Spincast Reels, this is a great for beginners who are just stepping into the sport of fishing. It is easy to use, easy to customize tool that will make fishing a lot of fun. It is mainly designed for freshwater casting but can be used in saltwater if taken care of properly and maintained well after every use. 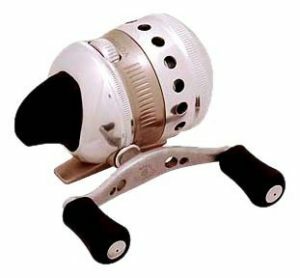 The body of the reel is made of rigid aluminum and is not too heavy so as a beginner you don’t have to worry about its weight and concentrate on the fishing part. The handle is also made of aluminum and has a soft touch knob for comfortable turning. The 4 bearings and the anti-reserve bearing give you more control and allow you to have the upper hand when you have to bring a runaway fish back in line. The gear ratio is 3.8:1 which is good enough for most casting. Easy to change spools and line on this reel make the fishing time hassle free and your learning experience more fun. Most anglers, whether newbie or someone who has gained years of experience in this sport, will appreciate the adjustable features and the simplicity of this reel. This Spincast Reel is one of the best Spincast Reels for Fishing. 4th on our list of the Best Spincast Reels by Zebco with a whopping seven bearing installation. The more the bearing the better the fishing experience when casting and reeling in the line. This reel comes with an ergonomic design which reduces user fatigue and can be configured for left- or right-handed retrieve. It is great for children or adults and basically anyone who wants to try out their hand in fishing. The triple-cam multi-disk drag system not only ensures a smooth retrieve but also more control over the drag when retrieving. 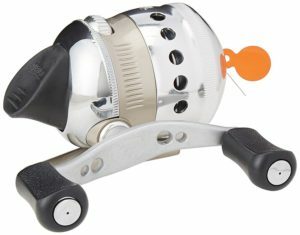 When you cash out on a tool like a fishing reel you look forward to something that will last you through bad weather and rough handling, and with the aircraft-grade aluminum covers and all metal gears on this model, you get just that and more. You can rely on the auto bait alert to signal a strike whenever a fish grabs the bait and makes a run for it, this way you can act quickly and bring in the fish faster. The rubber casting button is also an advantage when your reel has become wet and you need a sturdy thumb button that won’t cause your finger to slip. If you are hoping to catch some heavy fish then let the 10 pound line do the job for you, as it has enough force to deal with stubborn fish. As spincast reels are closed reels, you don’t have to worry about birds’ nests in the spool and can even share your rod with your children as they are easy and fun to use and absolutely fuss free. 5th on our list of the Best Spincast Reels is a Zebco Omega Pro Spincast Reel. 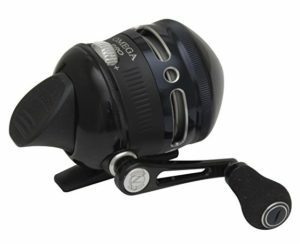 Excellent for light tackle fishing, the Omega Pro spincast reel is a sturdy tool with an all-stainless steel 7-bearing system which ensures a smooth fishing experience. Don’t let bad weather come in your way of this fine sport, if you can handle the weather then rest assured that the die-cast aluminum body with aircraft aluminum covers can take on the harsh conditions even better. The continuous anti-reserve clutch gives you enough control while the 3.4:1 gear ratio and the 19-inch line per turn lets you retrieve with precision and no friction. The best thing with all Omega Pro models is that their handles are super strong and lets you bring in stubborn fish and hard pulling lures with minimum effort. The handle can also be placed either on the right or left side for quick hand retrieving according to your preference. You can easily change the spool and use the spare spool for fast line switching. If you want to enjoy the weekend fishing away for small to medium fish then this reel is equipped with all the necessary features to make it an amusing experience. Some users have mentioned that the pins that unlock to cast and lock to reel fail to release when casting. 6th on our list of the Best Spincast Reels is a Zebco Omega Z02 Spincast Reel, Zebco keeps coming up with models that are equipped with features that every angler wants or needs in their fishing reels. This is no surprise, bearing in mind that they are the inventors of the spincast reel in the first place. The only thing ‘light’ about the Omega Z02 is its weight, making it great for long hours of fishing. But the power on this tool is no less than any spincast reel designed for heavy tackle. This incredibly fast and advanced model has a gear ratio of 3.4:1 which is just right to give you a pleasurable fishing experience, while the triple-cam multi-disk drag system helps you bring in fish that tend to put up a fight and tug the line. Once a fish is caught on the line it is very common for the reel to unwind but with the continuous anti-reverse function, you can prevent that and retrieve your fish very easily. The bait-alert is another function that alerts you as soon as your catch is ready to be reeled in. This reel also has a changeable right hand and left hand retrieve in case you want to lend it to a friend or family member who uses a different hand retrieve from you. Since this spincast reel has an ergonomic design, the thumb button is not made of plastic but of sealed rubber that is soft to touch and great for when the rest of the reel has gone slippery. Like most high-end spincast reels, this too is made of hard-wearing materials. The aircraft aluminum covers, all-metal gears and ceramic line guide all add up to the durability of this tool. The seven bearing design, an impressive improvement by Zebco, make the whole process even smoother. It includes an oscillating spool, to manage your line and also a spare spool that is very easy to change and can be handled even by beginners and youngsters. 7th on our list of the Best Spincast Reels is the Zebco 33 Spincast Combo, this combo is a great time saver. 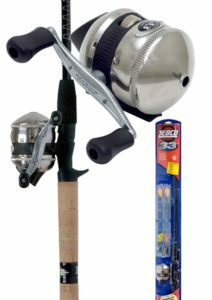 It comes with the Zebco 33 Spincast Reel and a 5-ft 6-inch two-piece rod. If you don’t already own a rod and don’t want to waste time on learning how to put a line on an open reel then this is the perfect duo for you. The changeable right or left hand retrieve on the spincast reel gives you the freedom to choose what is most comfortable for you while the new line management system provides better casting and gives you more control during a retrieve. Spooled with 100-yards of 10-lb cajun line, you can cast long distances and increase your chances of catching more fish. The 10-lb line is excellent for a small tackle but can also bring in fish that are more on the medium side. The 3.6:1 gear ratio and the bearing provide a smooth and reliable fishing experience. The rod has a two-piece aspect, making it great for easy transport and is built with an EVA grip so you have total control while fishing. It is also made by Zebco so you can be sure of its good quality and compatibility. Many users bought this combo for their kids and they loved the easy usage of this combo. It surely makes a great gift for anyone who has a love for fishing. 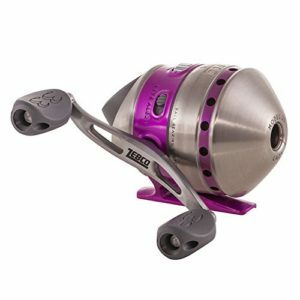 8th on our list of the Best Spincast Reels is a Zebco 33 authentic spincast reel, with its purple colored frame, will not only catch some good fish but also the attention of people. The color instantly differentiates this reel from the rest and you will be proud to show it off. But, the funky purple (more of a pinkish-purple) is not the only great thing about this tool, it also comes with a 3.6:1 gear ratio which is good for strong control over a retrieve and with the ball bearing drive you can enjoy a smooth fishing experience. The anti-reverse action stops the reel from unwinding during a catch and allows you to retrieve easily. Although made from hard-wearing materials to withstand any weather conditions, this spincast reel’s frame is made using lightweight graphite and the handle is all-metal with a rubber knob, making it durable and ideal for both youngsters and adults. It is spooled with 100 yards of 10 lb Cajun line, appropriate for casting long distances and tackling fidgeting fish. It has a built-in hook holder that hides the hook point and can be accessed from both sides of the reel. The micro-fine drag will give you a smoother feel even when you are about to retrieve a fish that fights to escape. 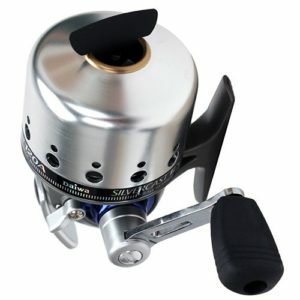 The changeable right or left hand retrieve also makes this tool versatile and in our opinion, this is a great spincast reel not only for yourself but even as a gift presented to a loved one who will immediately notice and love the unique design and color of the reel and also be impressed by its mechanism. Next, the Spincast Reel to make it to our list of the Best Spincast Reels is the Daiwa Goldcast Spincast Fishing Reel, Daiwa has really gone for the gold with this one. The gorgeous gold metallic frame not only gives this tool amazing visuals but also protects the reel against harsh weather and water conditions. This reel has earned praises for its durability and performance and is suitable for almost all kinds of fishing. It comes in three different models; GC80, GC100 and GC120, each with its own uniqueness but carrying the same high-end features and quality. The oscillating spool offers a tangle-free line winding for a hassle free experience while the ball bearing drive ensures smooth and easy retrieves. All the models have a gear ratio of 4.1:1 with a multi-disc drag system for an easy tackle of even the most stubborn fish. The line capacity on the GC80 is 8lbs / 75yds, GC100- 10lbs/80yds and the GC120 having the most capacity of 12lbs/ 100yds. The models also vary in weight with the GC80 being the lightest and the GC120 being the heaviest. The convertible right/left hand retrieve is perfect for switching sides and the anti-reverse action stops your reel from unwinding and gives you more control during a retrieve. It is best to use this reel for freshwater fishing but can also be used in saltwater if oiled and taken care of properly after every use. The last reel on our list is the Daiwa Silver cast-A series spincast reel. We have included this in our selection of top 10 because of its simplicity, beautiful design and the power to tackle any small to medium fishing in fresh water. It is available in a variety of sizes: 80, 100, 120, and 170 so you can pick the best one for you. The three ball bearings on this reel and the gear ratio of 4.3:1 ensures that you get a good amount of retrieval power and can bring in your catch with ease and minimum effort. The revolving titanium nitride line pickup turns and picks up the line for a no-tension feed and the anti-reverse feature (which can be turned on or off) keeps the fish from pulling the line in the opposite direction. The disc drag on the reel housing comes with a dial adjustment option that lets you choose the strength of the drag according to your fishing needs. This reel is suitable for both right and left hand retrieve. The shiny, smooth white finish and lightweight aluminum construction completes this beautiful spincast reel that any angler will be happy to own. So you have decided to buy a spincast reel because it is basically the easiest and most trouble-free type of fishing reel available today and we couldn’t agree more with your decision. But you should also be aware of what innate qualities to identify and what guidelines to follow when purchasing this kind of tool. 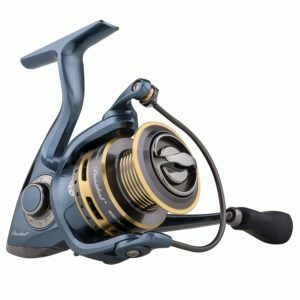 We have included some points below which you must look into while picking out the best spincast reel for yourself or for a loved one. Have you ever noticed these numbers on the specifications of a fishing reel but had no clue what they meant? Well, we are going to try and break it down for you in the simplest way possible. Let us say your spincast reel comes with a gear ratio of 3.6:1. The ratio here talks about how many times the line is wound around the spool with every complete turn of the handle. So in this case the line is wounded 3.6 times around the spool for every 1 complete turn of the handle. This information gives you an idea of how fast or slow your line retrieve is going to be after a cast. Lower gear ratios may indicate slower retrieves but they give you more cranking power. Spincast reels usually come with gear ratios of anything between 2.5:1 to 4.5:1, which is relatively lower than baitcasting and spinning reels. The line’s capability to use enough force on the catch and prevent it from escaping is determined by its drag system. A good drag system will ensure that you feel very less of a struggle while the line does its work on keeping the fish hooked and retrieving it smoothly. The drag may be located externally and found on the side of the reel, a larger kind that is easy to operate, or it may be placed internally with a small wheel to control the amount of drag. Both kinds must have drag controls that are easily accessible and simple to operate by the use of a thumb. Spincast reels don’t usually carry lines that go beyond 120 yards. The range may vary from 80 to 120yards worth of line, which is lesser than spinning and baitcasting reels. Most models come with pre-spooled lines and spare spools which are great for the price but they may not be what you are looking for when it comes to quality and endurance. The good news is that most modern high-end reels have interchangeable spools for you to change according to various fishing needs. It is a belief among some users that the more the ball bearings on the reel, the better the performance. It is true to some extent where the greater number of ball bearings provides a smoother and more effective operation but the quality of the bearing material must also be taken into consideration here. Lesser amount of good quality ball bearings are better than a larger number of ball bearings made of poor quality material. Spincast reels may have single bearing or anything between the range of 2 to 6 bearings. Zebco, a well known name in the fishing tool industry is the first company to manufacture spincast reels with a whopping seven ball bearing. High end reels must have aluminum frames in order to increase their durability and capability to withstand harsh weather and water conditions. Avoid plastic frames as they will not last you long and will need replacement within a short time. Metal coverings also provide better protection for the inner mechanism and are built for a sturdier base. 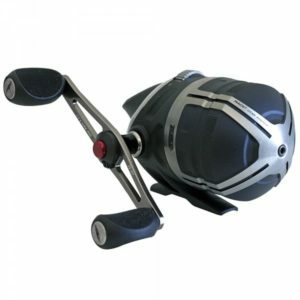 The size may vary depending on the reel’s line capacity and whether it is made for small, medium or big tackles. Although freshwater fishing is the best option for most spincast reels but they can also be used in saltwater if maintained well. Although spincast reels are used by both professionals and amateurs, they are recommended mostly for beginners to start learning the art of fishing with small to medium catches. Some models may be equipped with all the necessary features and power needed to tackle larger fish but most spincast reels, regardless of their brand and quality, tend to cater for smaller to medium fish. The line capacity, gear ratios and inner mechanism make this kind of reel better suited for fish that weigh less and require minimum power to retrieve. You can get a lot of spincast reels in the market and online, made by not so familiar names, they are cheap and at first glance may look like they will do the job but beware of false advertisement. Spincast reels may not be complicated tools but they do require precise mechanism and need to be made of high quality materials in order to handle and last through the conditions of harsh weather and water. 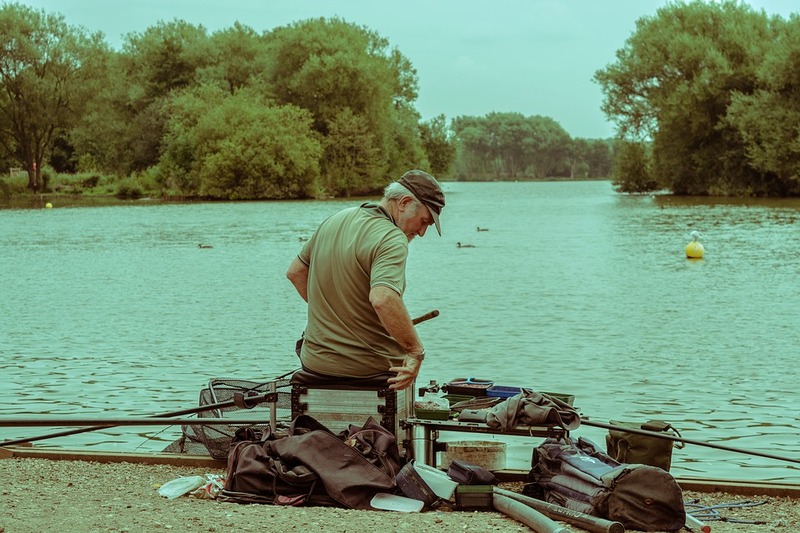 Names such as Zebco, Penn, Pflueger and Daiwa are some of the well known and trusted names in the industry today and for good reasons too. Their products are durable and result in years of reliable performance. If you are just stepping in to fishing then make sure your first spincast reel carries a good brand name so you don’t have to face unnecessary trouble, similarly, as a pro you would also probably need a good quality reel to be your partner in the sport. We strongly suggest you stick to well known and trusted names. Sure you have a budget and we respect that. You don’t really have to break the bank with the spincast reels that we have included in our list because they are quite affordable and carry great value for the money. Don’t go for extremely low or high prices because both kinds have their drawbacks. Choose a spincast reel that won’t burn a hole in your pocket with its price tag but have all the important aspects and quality needed to make fishing easy and enjoyable. 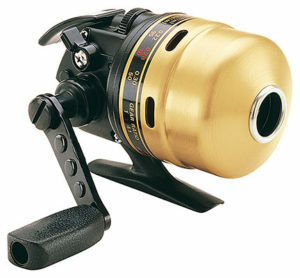 Spincast reels have been modeled after the spinning reel. They are quite similar when it comes to the mechanism but differ in some places. For instance, the works on a spincast reel is enclosed by a compact nose cone and you cannot over-spin the spool. They are also smaller in size and easy to use. Let us look at why you must get yourself a spincast reel, especially if you are a beginner. Easy to use: This type of reel is very easy to use and is the best kind of reel to learn with. It gives you a better understanding of fishing reels and also eliminates the hassle of lines tangling and causing distress. Lightweight: They weigh less and can be handled by small children too and they cause very little user fatigue. Affordable: These are no doubt the cheapest kind of fishing reels you can begin your fishing journey with. Decent gear ratios and line capacity: The gear ratios and line capacity on most spincast reels are just right for small to medium tackles and some can also handle the biggies if done right. Braid or Mono fishing line: Which one is better? This depends on what kind of fishing you are interested in. For example, while the monoline is preferable for live-bait fishing and kite-fishing, the braided line is great for bottom fishing/jigging. Monolines are cheaper and can hold knots better while the braided travels through the air and cuts through the water better. Do a little research on the lines and you can decide which kind is best for you. Can I use a high-speed reel as a beginner? If you are new to fishing then we suggest you stick to lower gear ratios because it takes time to learn how to fish at a slower pace with high-speed reels. Lines are picked up faster with higher gear ratios so if you are not an experienced angler then you can lose control and allow your fish to escape. Can I use my spincast reel to fish in saltwater? Freshwater fishing is recommended for most spincast reels but some high-end spincast reels with durable aluminum frames can withstand the rough conditions of saltwater, provided that you clean and oil your reel after every use and before storing away. How can I spool new fishing line on a spincast reel? Take the old line off the reel. Tie the line coming from the road’s end to the spool of the reel, making sure to take it through the hole in the cover first. Tie a knot and pull it tight to secure. Put the cover back on but make sure to hold the line firmly and in a straight line. Lay the filler spool on the floor to allow the line to come off the spool the same way it goes on your reel. Fill the spool to approx 1/8 inch of the lip, not too much. Now after everything is said and done, the question still remains- which spincast reel should you buy? This totally depends on your preferred style of fishing. Spincast reels are ideal for small to medium tackle and are designed to give beginners an easy and convenient way to learn and enjoy fishing. They are not too expensive so you can begin your journey with less investment and not be afraid to make mistakes while learning. These reels are also great as gifts and anyone receiving one will probably want to try their hand in fishing because of their user-friendly aspects, whether the person had any prior interest in the sport or not. They are excellent for children and adults alike, especially for those who are looking for something that can be operated in a few simple steps. In the Best Spincast Reels Reviews article try some valuable information throughout the process. However, we have to review the best product at Fishing Hunts. We will see you next time!